Getting around in the great outdoors is something a lot of people take for granted. Hiking, climbing over rocks, wading through streams, are all part of outdoor fun. But what if you have mobility issues? What if you are injured, or become disabled? Does an outdoor life become impossible? I believe that today's mobility equipment will enable many people to continue to be active outdoors - if you can find what you need. I live in a forest. Our driveway is gravel. Our paths around the house are old logging roads and skid trails. We have rocks, lots of pine needles, branches on the ground and oak leaves. Trying to roll a normal urban-type walker with 8-inch wheels through natural terrain is just plain hard work. And guess what - you stop going outside. If you only have a rollator with 8-inch wheels, you stop walking up the driveway or walking through the trees, (rolling over tree limbs is impossible). It's too exhausting to walk with an urban rolling walker over uneven unpaved surfaces. We need better options! There are only a few ready-made mobility devices that actually work well in the great outdoors where surfaces are filled with rocks, grass, tree limbs, sand and water. 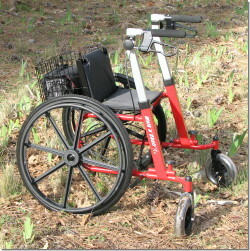 A mobility walker that works well in the woods is extraordinarily hard to find. I found mine at Walk'n'Chair. The All Terrain Walk'n'Chair is the 'real deal'. While you won't be scaling cliffs with it, you will be able to walk down most trails, up gravel roadways, follow skid trails, negotiate lumpy fields, and master most terrain. It changes the world for people who need a true all-terrain mobility walker. You don't have to be left behind. As per the description, the Walk'n'Chair is a folding wheeled walker with seat for people with lower extremity, mobility and walking disabilities. It has four wheels: two large front wheels similar to manual wheelchair wheels and two rear casters with oversized tires. There are two hand brakes, one located on each of the handlebars, and each brake stops one of the large wheels. The brakes are lockable. The seat is on the front of the frame between the large wheels. The Walk'n'Chair is a unique all terrain rolling walker that converts to a manual wheelchair and can also be used as a transport chair. That makes it perfect for me! With the large wheels forward, you use it as a rolling walker, taking on all terrain. When on paved surfaces or indoors, you can reposition the seat and handles, add the optional footrests and convert the Walk'n'Chair to a wheeled chair with the small wheels forward. Currently it comes with a collapsible metal accessory basket that can be attached to the seat back and used for carrying items. Overal Dimensions: The open width is 30 inches across the wheel base. Folded width is 15 inches. The seat measures (DxW) 10 x 15 inches, and the seat to floor height is 21 inches. Weight bearing capacity is 250 pounds. The unit weighs 42 pounds. If you look at the picture, in the walker setting, you walk with the large wheels in front of you. 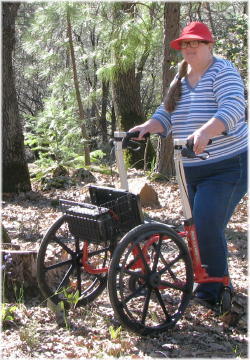 The large wheelchair wheels make rolling through the woods and rough terrain physically easier. In fact, it ROLLS through the woods. It ROLLS over small rocks and tree debris. It ROLLS down dirt and gravel roads with ease. The Walk'n'Chair was designed primarily provide for stable navigation and travel over gravel, dirt and other rough surfaces and easier maneuverability up and down street curbs. It works! It WORKS! For my own first test walk I left the house and rolled easily up our gravel driveway - something I had ceased doing with a regular walker. I'll say it again. I ROLLED right up the driveway - not getting stuck in the gravel, no heaving the walker to and fro. I rolled over the gravel, then I turned down the forest trail under the power lines. By trail, I simply mean a rough opening in the forest. I rolled right over pine cones, needles, leaves and some pretty good sized branches. Then I went back towards the house straight through the woods without using any trail at all. The big wheels of the Walk'n'Chair just rolled right over all obstacles. Please understand I haven't been able to walk through any of that terrain for several years. WOW! VIDEOS: Here's are videos from the company demonstrating the Walk'n'Chair in action. And here's a hunting video showing the Walk'n'Chair being used for bird hunting. In everyday use, it's best feature is the ability to roll over uneven terrain outdoors. With the large wheels forward, it excells as an outdoor all-terrain rolling walker. Reverse the handles and sit then it works very well as a transport chair (much better and more stable than the urban walker combo versions), and Walk'n'Chair performs adequately as a wheelchair. But the primary reason you'd want the Walk'n'Chair is for it's excellent outdoor handling characteristics. I also tested the walker in the house. By reversing the walker handles, you can then walk with the smaller wheels in front, which then makes the device look and behave similar to a manual wheelchair. It's just slightly wider than the manual wheelchair that I use for emergencies. So in our older home I'll continue to use my indoor rolling walker - unless I need the wheelchair function, then it's the Walk'N'Chair on duty. We took the Walk'N'Chair to the Fairgrounds and it performed beautifully on all sorts of surfaces. This last weekend I used it to get around various forest areas as we cleared duff for fire season. For shopping or town use it is fine used as a walker or transport chair. As a rolling walker it is less jarring on the wrists than my urban rollator in town. For use as a transport chair Walk'n'Chair is best configured in the 'wheelchair' mode. If you are spending all day at an event, having the option to convert the walker into a transport chair or wheelchair is absolutely wonderful! For me the key Walk'N'Chair feature is the outstanding all terrain manueverability over uneven surfaces filled with rocks, grass, tree limbs, sand and water. You don't need a groomed trail or a paved roadway to use this walker. It handles uneven terrain very, very well. What a practical device for outdoorsmen, hunting, fishing, ranchers and walkers! With the Walk'N'Chair when I roll through the woods and get tired, I can sit and rest. Depending on the location and surface, I can use the device as a wheelchair or get my spouse to push me. If we are outside all day, then having the options to use the device as a rolling walker, a chair, a manual wheelchair or a transport chair becomes remarkably nice. I feel more secure going anywhere and everywhere with my Walk'N'Chair. Keep in mind that having the large wheels forward that enables you to walk and roll easily over uneven terrain. In the wheelchair mode (small wheels forward) it will handle uneven surfaces similar to a manual wheelchair. The Walk'n'Chair is easy to push and is much more stable as a transport chair than the urban rolling walker-transport chairs. It is a true multipurpose device, and it really excells as an all-terrain rolling walker. Over the last few years my mobility has progressively worsened. I first used one cane, then two, then an urban rolling walker, then canes or hiking poles while in the woods. Frankly, it's too easy to fall in rough ground with anything less supportive than a rolling walker. However, anyone who has tried using an urban walker with 8-inch wheels outdoors understands me when I say that does not work. What I was really lacking was a rolling device that enabled me to walk around outdoors in our forest. For people who work outdoors, but develop walking, mobility and balance issues, the Walk'N'Chair provides a serious option for getting around the farm, ranch or forest to do daily chores. It's also great for travel and sightseeing trips. I'll bet you'll come up with some nifty additional uses once you have one of your own. Currently, there is no other product as multi-purpose (all terrain rolling walker, chair, wheelchair, transport chair combination) for use in the great outdoors where surfaces are filled with rocks, grass, tree limbs, furrows and puddles. The Walk'N'Chair is a sturdy, durable mobility rolling walker. It's not lightweight at about 42 pounds (similar to many manual wheelchairs), but then a good all terrain device has to be hefty enough to deal with rumpled terrain. I'm fairly heavy and the walker easily accomodates my leaning weight. It's not cheap, but you get what you pay for. A device that makes it possible to really walk through the woods and down a trail is worth some extra money. Ask anyone who has sat on the porch watching the world walk on by. By the same token, I think the device could a little heavy for a really frail elderly person. However, thanks to the company's free trial policy, you could try it out first if you are uncertain. I can already tell that I'm going to want to take my Walk'N'Chair lots of places. It's pretty easy to remove the wheels. And the wheels and body individually are fairly light. So it's pretty easy to carry the disassembled unit in a variety of vehicles. As seen here in the picture of our 4-runner, there's a regular rolling walker on the right and the disassembled Walk'n'Chair seen on the left. On any multi-stop day you'd be taking it apart and re-assembling it multiple times, but that's not a lot different from loading and unloading any urban rolling walker and the quick release wheels go on easily. 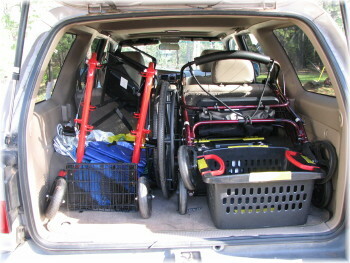 Transporting the Walk'n'Chair is the same sort of problem encoutered with any wheelchair-type device. If you don't want to take the Walk'n'Chair apart to transport it, it's possible that the folded Walk'n'Chair may be able to be carried in a manual wheelchair hitch carrier. Right now I'm looking at the Tilt'n'Tote wheelchair carrier. If it fits (or the carrier could be modified), then the Walk'n'Chair could be easily transported, folded like a manual wheelchair, without any disassembly. I'll have to ask our local rehab equipment dealer if this is possible. Walk'N'Chair is undergoing a complicated web site update. I suggest you look at the information at the web site, then simply phone the company (Brookefield Hunter, Inc. in Belgrade, Montana) with your questions or to take advantage of any of their offers: 1-406-388-1248. In the past they have offered a 30 day trial and/or rent-to-own, so ask questions. They are pleasant to work with as a company.